Free Technology for Teachers: A Canva Graphic Design Option I've Overlooked For Years! A Canva Graphic Design Option I've Overlooked For Years! Canva is a free graphic design tool that I have been using for years. I even aided the Canva team in the development of their education resources. Canva offers many great templates for creating infographics, posters, social media graphics. But it wasn't until this afternoon that I noticed an option to create a graphic of custom dimensions. 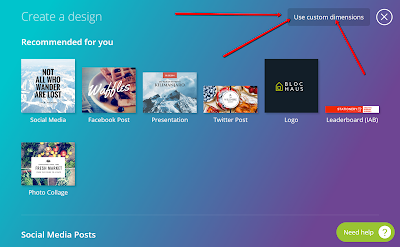 To use Canva create a graphic design with custom dimensions, log into your account then select "custom dimensions" in the upper, right corner of the screen. Whenever I write about Canva I get emails from teachers who want to know how students under age 13 can use it. The short answer is that Canva supports using G Suite single sign-on which means that students can use their school-issued Google accounts to use Canva even if they don't have active email addresses. The other option is to use a temporary email address service like those listed by Larry Ferlazzo to create accounts. Here's a video that I made about how to create image collages in Canva. This video that I made will show you how to use Canva's webpage design and publishing tool.